General Electric CEO Jeff Immelt is not happy with President Trump. And he's not alone. Dozens of top executives urged Trump not to pull the U.S. out of the Paris climate agreement. Now that he's decided to do it, many are voicing their displeasure. "Disappointed with today's decision on the Paris Agreement," Immelt said Thursday on Twitter shortly after Trump's announcement. "Climate change is real," he wrote. "Industry must now lead and not depend on government." "It's an absolutely bizarre and unprecedented moment in American history," said Brinkley. Elon Musk, the CEO of Tesla (TSLA) and SpaceX, announced that he's quitting the president's business advisory councils because of the decision. Musk wasn't the only Trump adviser to walk away after the announcement. Disney (DIS) CEO Bob Iger also said he will step down "as a matter of principle" from Trump's Strategic and Policy Forum, a group of business leaders who offer the president advice. Trump's announcement even prompted Goldman Sachs (GS) CEO Lloyd Blankfein to post his first ever tweet. "Today's decision is a setback for the environment and for the U.S.'s leadership position in the world. #ParisAgreement," Blankfein wrote. The Trump administration has plenty of ties to Blankfein's bank. Gary Cohn left Goldman to become a White House economic adviser, and Treasury Secretary Steven Mnuchin worked at the company for 17 years. In the run-up to Thursday's announcement, some executives used their positions to try to pressure Trump. Musk said he advised the president to stick with the Paris deal through White House officials and the business councils. Apple CEO Tim Cook said he spoke with Trump on Tuesday in an attempt to persuade the president to keep the U.S. in the climate accord but "it wasn't enough." In a memo to employees Thursday afternoon, Cook said that "today's developments will have no impact on Apple's efforts to protect the environment." Marc Benioff, the chief executive at Salesforc, (CRM) also voiced his disappointment. 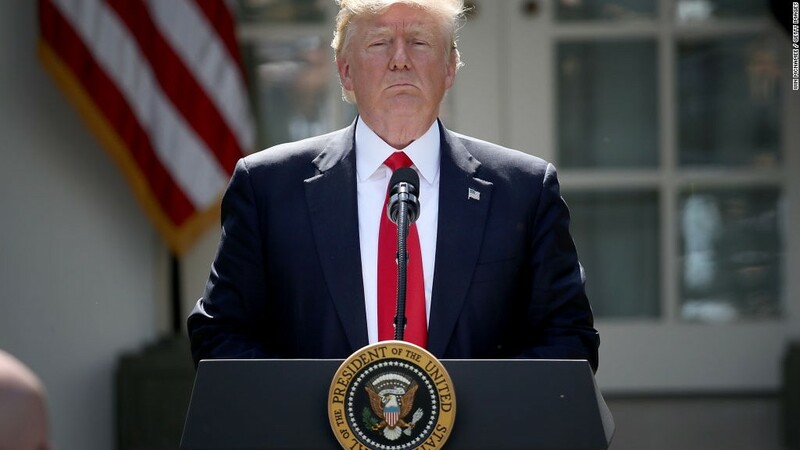 "Deeply disappointed by President's decision to withdraw from Paris Agreement. We will double our efforts to fight climate change," he said. Microsoft (MSFT) president Brad Smith echoed those sentiments. "We're disappointed with the decision to exit the Paris Agreement. Microsoft remains committed to doing our part to achieve its goals," he said. We're disappointed with the decision to exit the Paris Agreement. Microsoft remains committed to doing our part to achieve its goals. Google (GOOG) CEO Sundar Pichai also weighed in. "Disappointed with today's decision. Google will keep working hard for a cleaner, more prosperous future for all," he said. Meanwhile, over on Facebook (FB), CEO Mark Zuckerberg shared his own chagrin. "Withdrawing from the Paris climate agreement is bad for the environment, bad for the economy, and it puts our children's future at risk," Zuckerberg said. In recent months, hundreds of companies have lobbied the Trump administration to remain in the agreement. Apple, Starbucks, Gap, Nike, Adidas, L'Oreal and Monsanto all voiced their support for the Paris deal. Even oil companies like ExxonMobil (XOM) and Chevron (CVX) gave their backing. Exxon CEO Darren Woods wrote Trump a personal letter earlier this month asking him to remain in the pact, saying it ensures the U.S. is "well positioned to compete."